How To Schedule Task Efficiently In An Email? Is scheduling a task like an email, SMS or notification is a big question is front of you? Don’t Worry! XGenPlus ’Scheduler’ is designed to help email users create their daily task/meeting reminder list. ’Scheduler’sits in the same kind of Window as emails, so is accessible while users read email, use the search function or do other tasks. To add Schedule or Reminder, click the Scheduler and your task and choose the medium through which you need the alert from email, SMS or Pop-up. 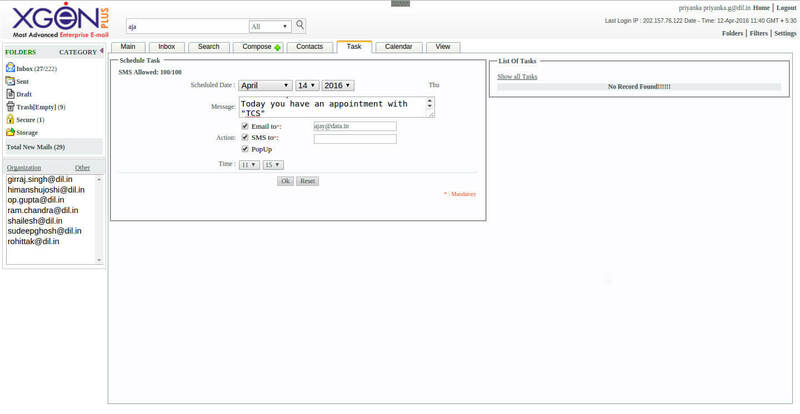 After composing your Email message, before clicking on the OK button set select date and time of delivery. Now the server will send that email automatically and you need not worry to be Online on that particular date and time. Autoresponder Email serves a lot more when you are going for a vacation and you have no access to the internet. With XgenPlus coolest feature of scheduling vacation mail, you can send a reply to people who will mail you under particular dates you have set in your email. How To Send High Priority Email Via XgenPlus To Get Receivers AttentionHow To Recover Permanently Deleted Emails In XgenPlus Email Server?